The following photos and narrative were provided by Billy Meeks, a former flight test boom operator at Edwards AFB. YC-14 Proximity tests. The test article did not have a receptacle. A painted on representative receptacle was used as a reference to provide proximity positions. FTBO’s directed receiver test pilot to fly around to selected points for handling qualities evaluations within the tanker flow field environment. From that, qualitative assessments of flying qualities were established. The YC-14 was a Boeing candidate. P-3 proximity tests. The Navy wanted to demo it , we wanted to demo it, and everyone wondered why an airplane that could fly 23 hours could possibly want more fuel. A bunch of photos showing various az/el deflections at short, mid and long boom lengths. All were planned test points and the boom operator directed the receiver to the coordinates where the FTE and aerial photog recorded the event. “Receiver” pilot offered comments. A few flights and several hours to complete. Hope didn’t bore. Navy P-3 testing with the KC-135 boom to drogue adapter. PROPELLERS. After developing a friendship with the NAVY Flight Test crowd it seemed like they developed a taste for compatibility testing. After the P3 they brought their C2 over for some prox work. We guessed they were using it as a surrogate for their E2. Initially, two Grumman test pilots flew the tests. Unfortunately neither of them were familiar with air refueling by our method. Two Navy test pilots assumed the duties. The tests were rather straight forward and unremarkable. Compatibility was assured. We watched the propellers constantly as in a normal refueling position the drogue appeared to be — at times— very near the propeller arc. However, manageable. Then.. came the night evaluate we had insisted on. We have the guy in the precontact for a period so we could all get our situational awareness spun up. I brought him forward and stopped him at 10 feet to evaluate that. Then on to the contact position. As he was maneuvering around while in contact, with the “S” in the hose, it became obvious if the drogue were to be released while forward it could, and likely would, penetrate the propeller arc. I requested he disconnect and fly the precontact. I turned on the light looked at Jimmy and he at me for a long moment and his look confirmed my thoughts.l terminated the test. In debrief I stated that the operation posed an unacceptable risk and I would recommend the practice not be continued. The Navy guy stated that he had hoped we would make that recommendation. No further action. It’s been said , “one good test is worth a thousand opinions”. It’s also axiomatic that no test, regardless of outcome, is a failure. It may contain some elements of failure but, if something is learned that can lead to success, then the test is a success even in failure. The accompanying photos are an example. Phil Zamagne was the lead on a night lighting evaluation of A-10 lighting. We went out after dark and caught up with an A-10 being piloted by an AFTEC (previous to AFOTEC) pilot for an operational look. Phil completed his test card deck and concluded the test. I sniveled for one more contact and he permitted me to do so. The A-10 returned to the precontact, reported ready and moved forward. I put the nozzle in the receptacle and instead of a contact made light, all the lights went dim on the instrument panel. I reset with the nozzle in contact and got the same result. So, I thought let’s start over here and retracted the boom except it would not come out of the receptacle. Uh, Oh. So I monkeyed with it and it still would not come out. By now the A-10 guy was starting to get a little antsy and pretty much started running th limits. I/we finally got him settled down and following us and we tried a bunch of stuff all to no avail. I/we are starting to get concerned. After discussing our options we were down to a forced disconnect. So I set it up with him at mid boom and he retards his throttles, slides back to the end and, KLUNK. We are still stuck with him and him with us. Oookaay, let’s try this again. Same thing. All right, let’s enhance this a bit. Started him at 6 feet, he pulls his throttles and I stand on the extension. Zip, KLUNK. So we know we can’t land this way and he’s not amenable to us dragging him off on Mount Whitney. Just what are we going to do. I’m wondering if Phil is laughing at me but I’m scared to look to see. As it turned out the A-10 is one of two prototypes and had hydraulic system control switches. Someone asks and he confirms and turns off the switches and just like FM the boom comes out. This whole thing went on for what seemed like 30 minutes. What happened? The A-10 has/had a “T” handle which controlled the deploy/retract function of the UARRSI. When he came back he pulled the handle but not all the way out. That allowed the slipway to bleed down but not lock down. He got a ready light as he normally would. When the boom went in it created an air flow situation such that the slipway door floated up behind the ball joint and captured the receptacle. See fotos, zoom and note the fractures in the assembly. The fix: redesign such that the handle had to be fulled extended and locked by turning 90 degrees. This is a test failure that resulted in a successful outcome. I’m claiming hero status for Phil and I since we maybe prevented some youngster from from finding out what it was like to land hooked up to an A-10. C-2 Greyhound refueling from a US Marine Corps KC-130 tanker. Here is a rare picture of the only C-2A Greyhound fitted with a refueling probe. The C-2 is making contact with a drogue basket from a US Marines KC-130 tanker. Picture is dated from around 1979 or 1980. Photo submitted by E. Hamilton and found at the Air Movements Terminal RAAF Base in Darwin, Aus. 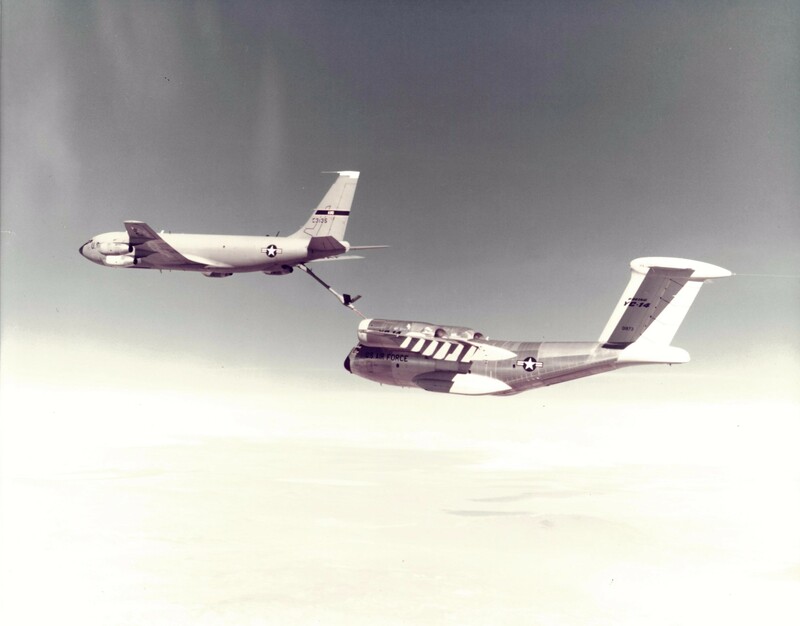 The YC-14 prototypes were not equipped with in-flight refueling receptacles, but simulated refueling conditions behind a KC-135 were conducted. 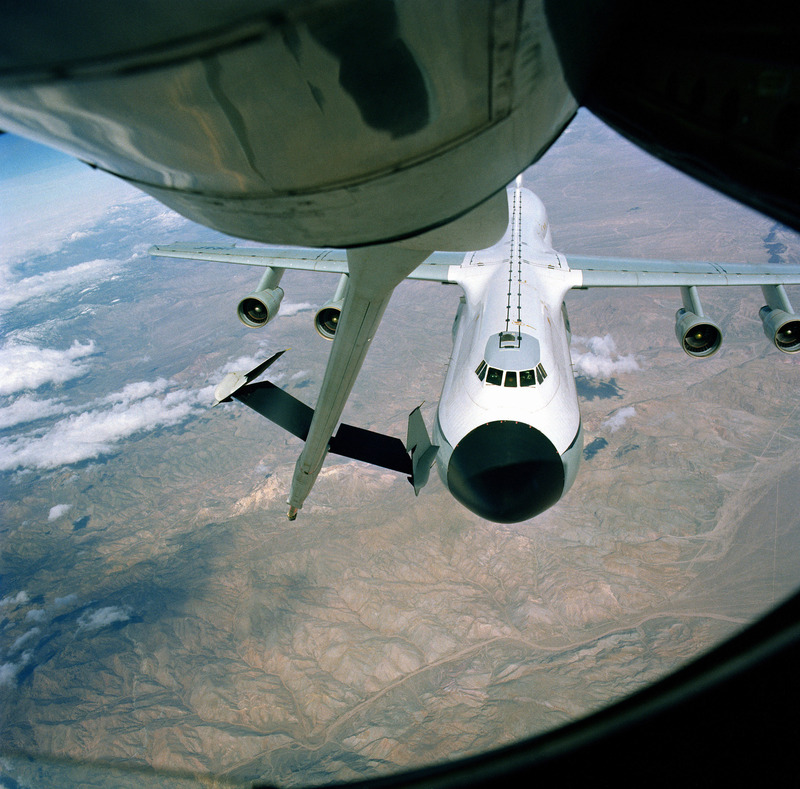 Utilization of the YC-14 as a tanker for receivers such as the YC-14, fighters, and helicopters was also evaluated. The Boeing YC-14 was a twin-engine (STOL) tactical. It was Boeing’s entrant into the United States Air Force’s Advanced Medium STOL Transport (AMST) competition, which aimed to replace the Lockheed C-130 Hercules as the USAF’s standard STOL tactical transport. Although both the YC-14 and the competing McDonnell Douglas YC-15 were successful, neither aircraft entered production. The AMST project was ended in 1979 and replaced by the C-X program. Boeing proposed a 747 adapted as an aerial refueling tanker during the 1970s Advanced Cargo Transport Aircraft (ACTA) program that produced the McDonnell Douglas KC-10A Extender for the USAF. This is a summary of the aircraft modifications and flight tests of the proposed KC-33. 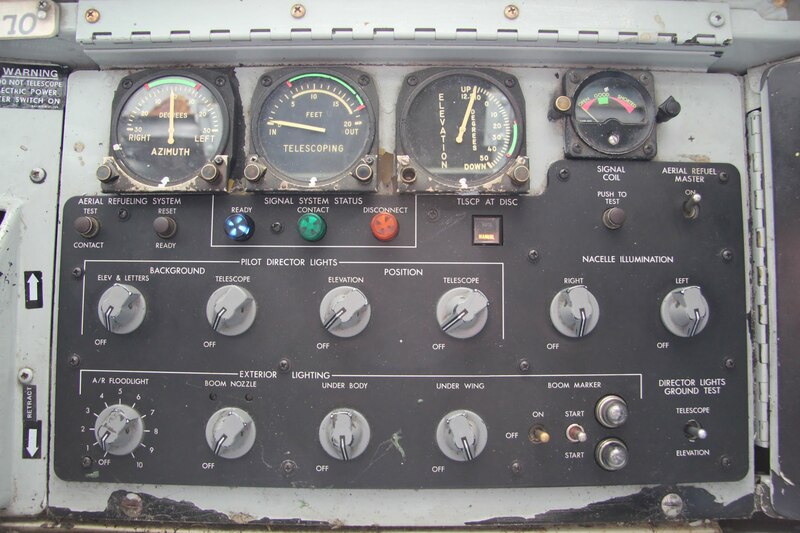 Here is a picture of the boom operator’s panel of the KC-135 stratotanker. The gauges at the top indicate the position of the air refueling boom. The green arcs represent the air refueling envelope that the receiver aircraft must remain inside of. The red markings on the gauges are the limits of the air refueling envelope. If the receiver exceeds these limits and the tanker’s signal system is in NORMAL, then an automatic disconnect will occur. The boom signal coil voltmeter on the right of the panel shows the status of the boom nozzle signal coil when the PUSH TO TEST button is pressed. The voltmeter displays OPEN, GOOD, and SHORTED. The TEST CONTACT button advances the signal system to CONTACT when pressed if the signal amplifier is operational. The RESET READY button resets the signal system to READY. The blue, green, and orange lights display the current status of the air refueling signal system. The blue READY light indicates the system is ready for contact with a receiver. The green CONTACT light indicates that the boom is in contact with a receiver and that fuel transfer can occur. The orange DISCONNECT light indicates that a disconnect signal has been received. The TLSCP AT DISCONNECT (telescope at disconnect) switch selects if the boom will automatically retract when a disconnect signal is received. It has two positions AUTO, and MANUAL. The PILOT DIRECTOR LIGHTS are controlled by four rheostats for the background elevation & letters and telescope and for the position elevation and telescope pilot director lights. The NACELLE ILLUMINATION rheostats control the brightness of the engine illumination lights. The A/R FlOODLIGHT rheostat controls the brightness of the tail mounted air refueling floodlight. The BOOM NOZZLE rheostat controls the brightness of the boom mounted nozzle light that shines light on the boom nozzle. The UNDER BODY rheostat controls the brightness of lights mounted on the inboard side of the inboard engine struts that illuminate the under body of the aircraft to help with night air refueling. The UNDER WING rheostat controls the brightness of lights mounted on the underside of the aft fuselage that illuminage the underside of the wings. The BOOM MARKER controls turn on ultraviolet fluorescent tube lights mounted in the boom that cause fluorescent markings on the boom to glow for night air refueling. The ON/OFF switch controls power to the lights and the START positions of the start switch each turn on one of the two fluorescent lights. The neon lights indicate the status of the marker lights. The DIRECTOR LIGHTS GROUND TEST switch is used to turn on all pilot director lights at once for maintenance testing. I have amassed a very large collection (over 1,000) of air to air refueling pictures and want to share them on this website. My collection includes many rare pictures (ever see an A-10 refuel from a KC-97?) of over 120 different receiver types. Whenever possible I will try to provide a link to the source(s), but I have been collecting the pictures for years on my hard drive and it may be very difficult to track down the original source. If you find any errors on this site or have additional information about the topic please let me know and I will update the page. Please use the comments section below the images as a place to discuss the picture and leave further information for others to read. Your discussion adds greatly to the historic value of this site and to the legacy of air refueling crew members. Below is a brief list of things I am looking for, but any info is welcomed. Photographs and information about Boeing 747 tankers. I would especially like pictures of the boom operator’s compartment, instruments, and panel. Please get in contact with me via the email address above if you have any information about the 747 tanker.